The origin stories for heat pump technology are economic. Applying Lord Kelvin’s theory that disputed the concept that heat could only flow ‘downhill’, Peter von Rittinger turned an expensive wood-based salt processing enterprise into a money maker by using heat pumps to desiccate salt brine. In the 1970s during the oil embargo, modern heat pump sales increased by 500% as heating and cooling costs squeezed homeowners. The innovation of ductless heat pumps in Asia created an alternative to costly kerosene space heaters and PTAC units. 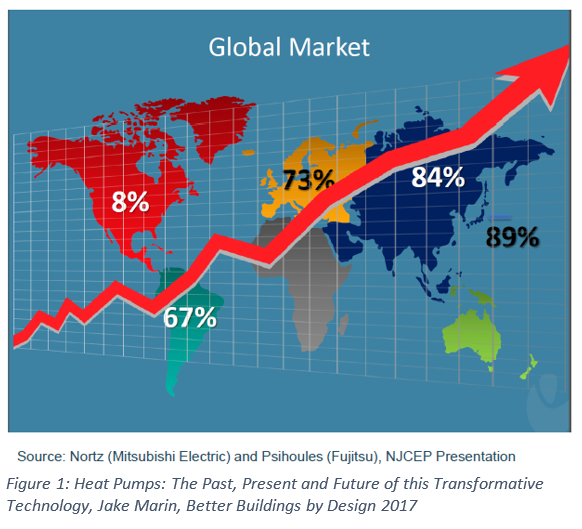 The energy efficiency of heat pumps directly translates into financial savings; why does the U.S. market still pale in comparison to the rest of the globe (Figure 1)? 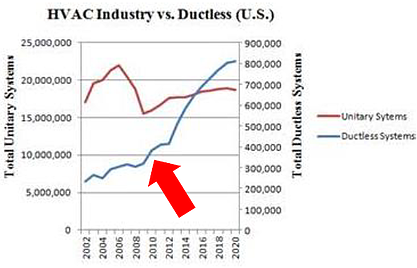 Despite their small market share in North America, heat pump manufacturers are seeing their own economic motivations to focus on the U.S. From 2015-2016, ductless, mini-split systems grew by 20% (Figure 2). Water source heat pump sales in 2015 neared 200,000 units, an 11% increase from 2014 and 900% growth since 2009. In 2014, air source heat pump shipments were the highest on record with 2.4 million shipments, up from 1.7 million in 2012. Investments in U.S. heat pump manufacturing topped $7B last year, with Daikin building a $417M facility in Texas and two other parts manufacturers relocating to the U.S. With this influx of companies designing products specifically for the North American market, units are being tailored to colder climates and product offerings are becoming more diverse. Performances are improving, and residential and commercial buyers are noticing. Standard air-to-air heat pumps can now operate as low as -13°F and can provide 100% capacity at 5°F with coefficients of performance (COP) of 2.0. Ground source heat pumps can achieve COPs of up to 5.0, require no backup, and provide whole home heating and cooling to all building types in nearly any U.S. climate. Enticed by smaller models with better features and more attractive styles, U.S. consumers will likely continue the upward trend for heat pump sales. We can be confident in this assertion of growth by looking to the increased acceptance of beneficial electrification. Beneficial electrification is the net positive effect of fuel switching; by increasing electricity use marginally, primary energy use and GHG emissions can be decreased and productivity can be increased. “…End uses that traditionally would have created more emissions if powered by electricity are at or near a tipping point where their electrification would create fewer emissions than if they were powered using fuel oil, natural gas, propane, or gasoline”. A concept of emissions efficiency (also called ‘emiciency’) assesses the GHG emissions associated with methods to power end uses and takes into consideration that electricity fuel sources are becoming increasingly renewable, and overall emissions rates associated with grid supplied electricity are falling with each passing year. 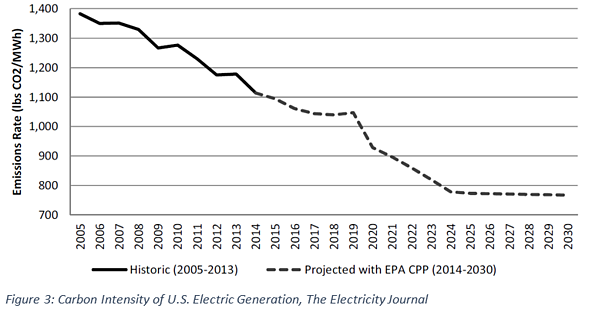 As the U.S. electric sector implements GHG reduction policies, the grid’s overall ‘emiciency’ is increasing due to technology advances and cost reductions of cleaner electric generation (Figure 3). As more owners and developers are noticing the increasing emiciency of the U.S. electric grid, beneficial electrification is seeing a renaissance. Lawrence Berkeley National Laboratory has asserted that “widespread electrification of passenger vehicles, building heating, and industry heating” (emphasis added) is essential for reduction of greenhouse gas emissions. 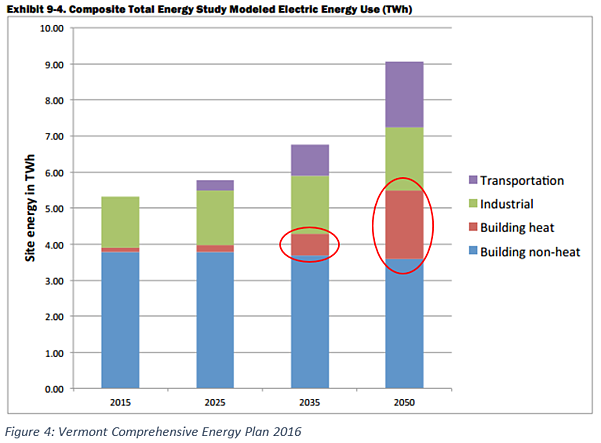 For example, the state of Vermont’s Comprehensive Energy Plan (CEP) forecasts a substantial increase in electric energy use for building heat (Figure 4), acknowledging the effects of beneficial electrification. Heat pumps are the key to beneficial electrification potential, and as the technology is increasingly viable in colder climates, the U.S. should be seeing continued sales growth and expansion into new regions.